There are a lot of “Best LSAT Prep Book” lists out there. Most of them aren’t all that great – so we’ve tried to build a better list. We’ve looked through most of the books on the market today. And we’ve written a brief summary for each of our favorite picks. Our goal is to showcase each book’s strength and weakness. Your LSAT score is important. You’ll be spending a good amount of time studying so it’s critical you get the right advice. Before continuing we recommend watching instructor Sam Fox explain how long it takes to study for the LSAT. The following is a chart of the best LSAT prep books. Keep reading for a short review of them all. Your LSAT score is an important factor on your path to law school. And if you’re aiming for a top score chances are you’ll be spending a good amount of time studying. But what you study with is important. Follow a weak study routine or practice with the wrong material and your score will suffer. That’s why it’s important to find the right LSAT prep plan. Since you’re looking for the best LSAT prep books, chances are you’ve already decided that a prep course isn’t for you. And that’s just fine. We believe that a solid prep book partnered with consistent and dedicated preparation yields to strong scores. So why should you trust our opinion? We explain what makes each book great, and what each book’s flaws are. Content is king. For our reviews we look through each book’s review material, practice question quality, and testing strategy effectiveness. We evaluate which books are best for training on specific sections of the LSAT. Everyone’s different and we all have our own weaknesses. Knowing who each book is designed for makes it easier to match to your own abilities or aspirations. 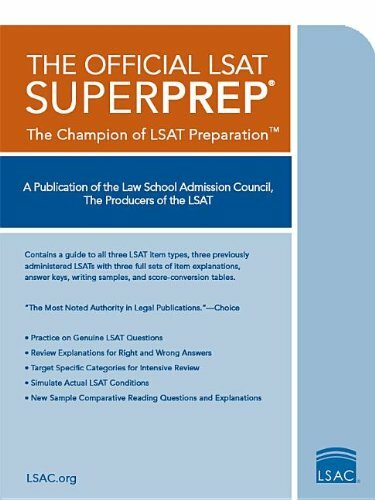 This guide is created for students that are motivated to work towards getting a high score on the LSAT. Working through these books will take time and effort. You’ll have to work through hundreds of practice questions before things begin to stick. Practice makes perfect, remember that. If you’re willing to put the man hour into studying then buying a prep book will be the easiest part. But know, if you’re not willing to put time into studying, your choice of book does not matter. Best these are books that everyone should use, regardless of skill level. They offer comprehensive review or have the highest quality practice questions available. Good: good all around books but not the best – these are solid options to use for supplementary practice. Extra Practice: supplementary books intended for students who are focused on obtaining an exceptionally high score by mastering difficult LSAT questions. In most cases, these should only be used after completing a prep book. We believe that a solid prep book partnered with consistent and dedicated preparation yields to strong LSAT scores. But self studying isn’t for everyone. It depends on you’re self motivation and your learning style. Think back on your undergraduate experience. Did you learn better by reading the textbook or by listening to the professor during lectures? If you absorb material better when you read it than when you listen to it, a prep book might suit you well. Second, do you have the discipline to stick to a study schedule? Books need self motivation. If you recognize how important your LSAT preparations are and you’re willing to dedicate the time to a study schedule we recommend using a prep book. If you learn better by listening, or if you find it difficult to stick to a study plan,you may find an LSAT prep course to yield better results. Reading comprehension: measure the ability to read, with understanding and insight, examples of lengthy and complex materials similar to those encountered in law school. Analytical reasoning: measure the ability to understand a structure of relationships and to draw logical conclusions about that structure. Logical reasoning: assess the ability to analyze, critically evaluate, and complete arguments as they occur in ordinary language. If you’re just starting to study for the LSAT, we recommend taking a practice test to gauge your current skill level. Take a look at our list of free LSAT practice tests to get started. After taking a practice test, assess your results. If you’re new to the LSAT you may find that you are weak overall. If that’s the case, we recommend purchasing a prep book that covers the entirety of the LSAT. If you’re able to identify a specific weakness we recommend finding a book that targets it. Weaknesses are ripe for the most improvement. The three PowerScore Bibles below are the best books available for targeting each section of the LSAT. We highly recommend their use to improve your weak areas. PowerScore offers these books in a LSAT Bible Trilogy bundle. There is no better LSAT preparation available than these Bibles. PowerScore also has a variety of LSAT self study plans to keep you on track. For most students, the logic games section is the most difficult section of the LSAT. And most test takers will agree that it’s their LSAT Achilles heel. Improving your score is possible. And the PowerScore Logic Games Bible is the best prep book we’ve found to tackling logical games. The book explores many techniques for approaching different logical games. The instructions are clear with guidance on where to look to make the right deductions. And how to best draw problem inferences. The material reinforces effective problem solving organization so you’re efficient. This is a huge hurdle for many students. The LSAT puts you under serious time pressure. You’re forced to tackle hard questions fast. The Logical Games Bible is the best prep book to tackle the logical games part of the LSAT. Mastering the LSAT takes time and plenty of practice. And that’s the approach PowerScore uses in it’s Logical Reasoning Bible. There’s a comprehensive approach taken towards every Logical Reasoning problem. The book provides clear and detailed instructions for each trick you can expect. And there are plenty of tricks. The techniques and tips are not quick cures though. Nothing is that easy. But these approaches are systematic. One’s you’ll develop and as you work through the book. The PowerScore Logical Reasoning Bible offers plenty of question drilling. You’ll get better at identifying and solving many different types of logical problems. And that gives you a vast testing advantage. At 650 pages in length this book covers it all. Many students struggle with Logical Games. But Logical Games are much easier to improve on than Reading Comprehension. If you’re struggling with reading comprehension, you’ll have to work harder to improve. The PowerScore Reading Comprehension Bible is the best prep book we’ve found to do that. It delivers by offering key strategies for decoding and deconstructing reading passages and questions. There are 80 different passages to work through. PowerScore categorizing each of the different types of questions you’ll encounter. And it delivers targeted tips and strategies for each one of those problem types. By analyzing the features of each passage, you can identify key similarities. Similarities that help you better understand how passages are constructed. How they can be recognized. And how they can be solved. A few years ago there was a new comer to the LSAT test prep world. Mike Kim, a former Manhattan LSAT book author and current LSAT instructor. He’s done an awesome job in creating an effective LSAT learning system to shake the market. This is the best all-inclusive LSAT test prep book available today. It’s approachable for anyone to pick up as it covers the basics and then builds on them. There are over 200 official LSAT questions included with detailed answers. But more important, the trainer has invaluable teachings, strategies, and drilling. Mike believes that the LSAT tests for your skills. Not your memorization. Who cares if you can categorize question types? You need to be able to understand what wrong with an argument. You have to be able to justify a conclusion from its premise. And that’s what this build strives for. Helping you build better testing habits. We recommend Mike’s 16 week LSAT study plan to keep you on track. Introducing the LSAT is a jump start guide to LSAT prep. Author, Nathan Fox, has written a prep book that goes over 80 percent of the concepts you’ll find on the LSAT. How? By cutting out the fluff that traditional prep books have and honing in on what matters. Nathan introduces the LSAT by breaking down each section of the test. He explains the process and reasoning behind key question theories. Nathan’s style of writing is unique. Making this one of the most engaging prep books we’ve ever read. In fact, there are a few F-bombs sprinkled within the text. Yes, the written language can be brash but it’s straight to the point. We recommend giving this LSAT guide a read if you’re looking to a get a better grasp on the basics. Too many students register for the test without knowing what they’re getting into. This isn’t a content review or practice book. Like the title states, it’s an LSAT primer. Here’s another logic games only offering, but it’s one of the better one’s we’ve taken a look at it. Blueprint for those not familiar is best known for its LSAT prep classes. You’ll find 600 pages of logic game prep material here. There are plenty of sample games and drills to work on. Like all good LSAT prep books, real official LSAT practice questions are used. Blueprint also includes online access to video explanations of every question. Although the answers are in the book you can use the online video to see someone doing the problem in real time. The book takes a more humorous approach to tackling logic games. You’ll find a cartoon LSAT ninja giving you pointers, tips, and tricks. The book is well organized and divides logic games into two basic types. Ordering and grouping. The best ways to tackle each are reviewed. Both the PowerScore and Blueprint logical game books are great. They’ll prepare you well. PowerScore has a better publishing reputation. 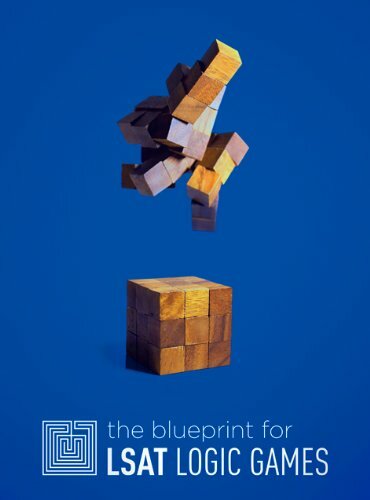 But Blueprint is much more fun to work through. We recommend grabbing whatever is less expensive. The latest in LSAC’s 10 Actual Series. 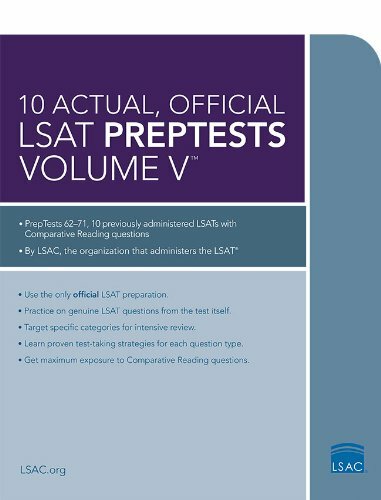 The Official LSAT PrepTests Volume V contains LSAT test numbers 62 through 71. These tests were administered between December 2010 and 2013. There are 10 official LSAT exams here. Which includes a writing sample for each test. Test score conversion tables are also included to see how you’d score on each exam. For the LSAT, practice is everything. And these test compilations are great opportunities to test yourself and improve with. Here’s another official test compilation. This book is also put together by the Law School Admission Council. It combines three past February LSAT’s from 1996, 1999, and 2000. You’re thinking that’s a dated. But don’t. What makes the SuperPrep book unique are the answer explanations for every part of the tests. Explanations straight from the test makers. Written in a thorough and clear manner. You won’t find strategic advice. But the explanations are a useful tool towards understanding the LSAT by the same people who write it. As for the age of the past tests, don’t worry. The logical and problem solving aspects of the LSAT haven’t changed. So there’s no need to avoid past LSAT tests. An updated version to the SuperPrep series. Like the one before it includes 3 complete prep tests with answer explanations. This time around the tests are newer. They’re from December 2010, June 2011, and a recent undisclosed LSAT. The test dates may seem dated when you consider the book was released in July 2015. That’s because LSAC doesn’t release the latest test versions for their SuperPrep series. SuperPrep books focus on providing comprehensive answer explanations. And the LSAC written explanations are fantastic. You won’t find anything like them anywhere else.